Last Friday we introduced a new ranking system. Not only does it feature a 1v1 ranking, it also features separate rankings for the European, American and Asian servers. We think it is a great addition for 1v1 players, and it should also get more players to play on their own cluster. FFA ranks were not representative anymore. To get high on the FFA ladder it was better to play 1v1 games, than to play FFA games. This more or less destroyed the meaning of the FFA rank. What should we do with 1v1 toppers now? Boosting in FFA (playing together in FFA). Boosting in Team (getting a low rank on purpose, to make your team strength lower, thus gaining more rank points when winning). Leaving in team games (which could then be used to make boosting possible). Playing against your team in team games. Now, we didn't solve cheating at all in this update, but we did some things to facilitate to fight better against cheaters in the future. 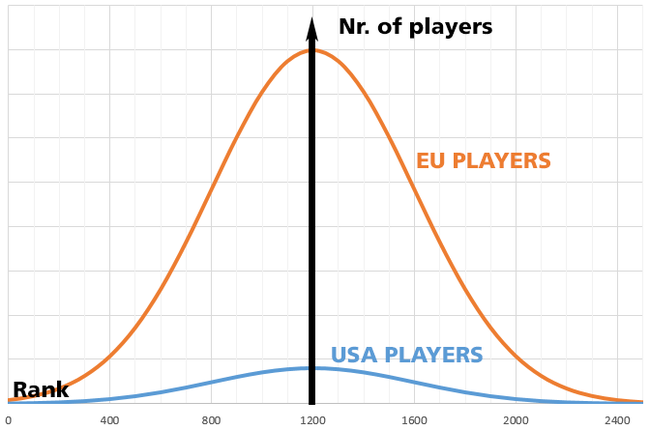 If you liked to rank, it was impossible to get a high rank on the American/Asian cluster, compared to the EU players, because there are more players on EU. This is because of the way the ranking system works. Every 400 points you are higher than your opponent, means that you will win 9 out of 10 games from him. Lets say you have a ladder like now on the EU and a new ladder with just 2 persons (like Asia =P). To get a rank of 2400 on the 2 person ladder, you would need to win 999.999 out of 1.000.000 games. Not only is this an enormous amount of games, it is also a very low change of achieving a track record of 999.999 wins against anybody, considering you or your equipment (or our servers) might fail. If you have other players which are equally well, you can afford it to lose sometimes. In general the players will distribute like a normal distribution. The amount of people that have a high rank, on a low amount of people ladder, is lower. But it doesn't mean they are not equally skilled! By giving the competitive players of Asia and USA their own ladder, we hope that they don't go to the EU servers so often, thus filling their own servers, and causing less lags on the EU server. No good integration of the rankings ladder with your account In the future we will make it so that you can look up your rank and position more quickly. We laid the foundation to do it. To combat the problems, we came up with the solution we have now. The reason to split it on cluster is very important: to make people play more on their own server, thus filling their own server with local people, and thus have less lags on the EU cluster. I think the FFA, Team and 1v1 ranks are self explanatory. The team hidden needs some explanation. In the past we had unranked team games, which didn't add up to your team rank. Now we have a seperate ladder for unranked team games: hidden team ladder. Hidden team ladder, what is it good for? Ranks are meant to be a measurement of your strength. Playing games against people of your strength is much more fun than to play games against people who are way stronger or way weaker than you are. To facilitate this, we use the rank to determine who you are going to play against. Games of your level are suggested at the top of the lobby list. Why do people cheat their rank? Not because they want to play against people of their strength. Having a high rank results in having a higher prestige. It is the only prestige quality you can't buy. ** When you have a high rank, people will stop calling you a n00b. They might even look up to you. To gain this prestige, people find ways to cheat. And cheating spoils the fun of the other players, who are cheated upon. There are several ways to combat cheating. One of the ways to do this, is to hide the rank of a person. Most effectively removing the reason why they cheat. To make sure people still play against players from their own skill level, we did add a hidden team rank. The hidden team rank thus primarily functions as a match making mechanism. The other thing hidden team rank can facilitate in the future, is to combat cheating in ranked team games, without removing the accessibility and fun that team games can bring to all the people. Let me explain. I have to warn though, that the next paragraph is all speculation, and not decided upon yet. One of the thoughts we have to make cheating in team games tougher, is to make getting caught result in high losses: time or money. This would probably mean that team games would become less accessible for many (fake) players. With a separate rank for unranked team games, we make sure that the game mode of team play would still be accessible to all players. Currently we have a big dilemma. By introducing a separate 1v1 rank, we didn't solve the problem of the 1v1 players being currently on top of the EU FFA chart. In the long term they would vanish away into oblivion by the weekly rank decay. If we would let it be, the current 1v1 players have 3 options to stay on top of the chart: 1. Start playing FFA like mad and thus loosing a lot of rank. 2. Play 1 FFA game a week and thus maintaining their rank. Most preferable in an unranked game to reduce their risk of losing FFA points. 3. Don't play at all The rank decay is about 1% per week. That would mean about 25 rank points per week. It would mean the current number 1 player would be able to stay on top of the charts for 3 more months, just by being inactive. One of the possibilities to combat this, is to make a rank reset. A rank reset can be a lot of fun. Everybody gets a fair chance to gain a high rank again. We would also get rid of a lot of inactive ranks. However, people who spend a lot of time on their current position would not be so happy. If we are going to do this, the current top players would get an award for their achievements. However, we are also considering other solutions. I am wondering though what you would think of a rank reset, or maybe have a better solution? 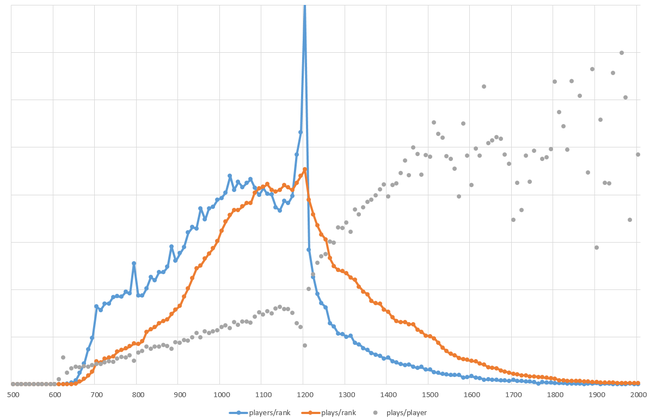 We can see very nicely that the normal distribution is not determined by the amount of players, but by the amount of plays the players play. Something else we see, is in order to gain rank, you need to practice. People who practice more will have higher ranks (on average). Also note that above 1400 the amount of people with a rank gets so low, that the spread in the plays/player becomes really high. Subscribe to get notified about our progress about this battle.